I love soup…actually correction I adore soup. There is just something so comforting about a warm bowl of tasty goodies that play well with each other. I also love fall. It is my favorite time of the year and it is on the horizon as we speak. There are so many great things about the season and the food that goes along with the season. Have you tried any of my other delicious soups? 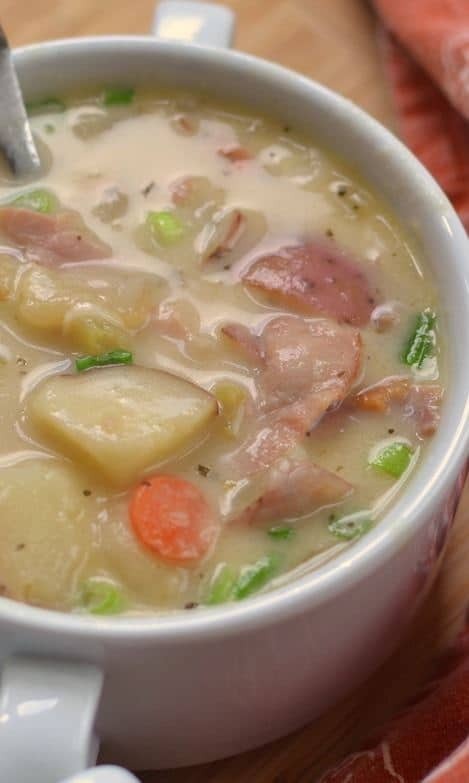 Creamy Asparagus Potato Soup, French Onion Soup and Sausage Penne Soup are just a few family favorites. There are so many options for great soup and so little time. 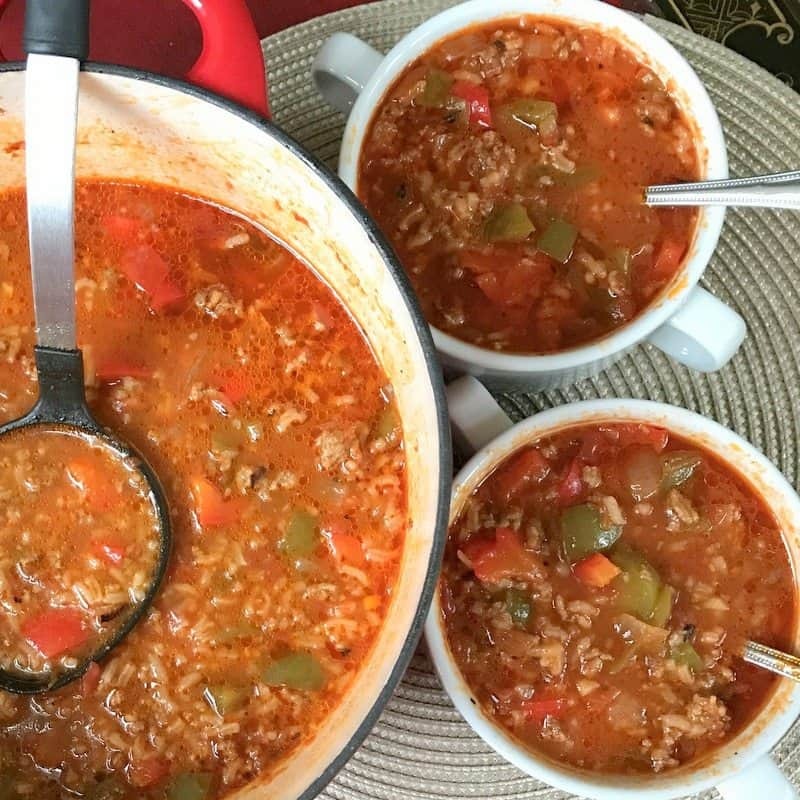 This flavor packed 30 Minute Ham Bean and Rice Soup is a time savor and can be completed in 30 minutes including simmering time. 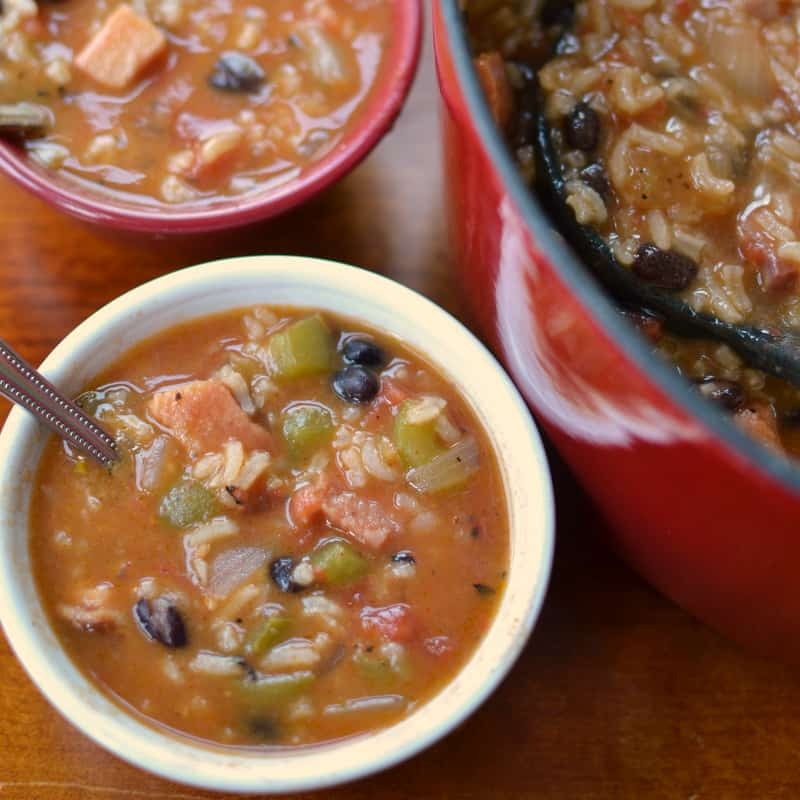 This 30 Minute Ham Bean and Rice Soup combines ham steak, black beans, onions, garlic, green pepper and rice into an amazing taste experience. It is delicious and quick to put together making it a perfect week night choice. You can find this and lots other fun soup quotes at BrainyQuote! I just love all those fun quotes! So what are you waiting for? 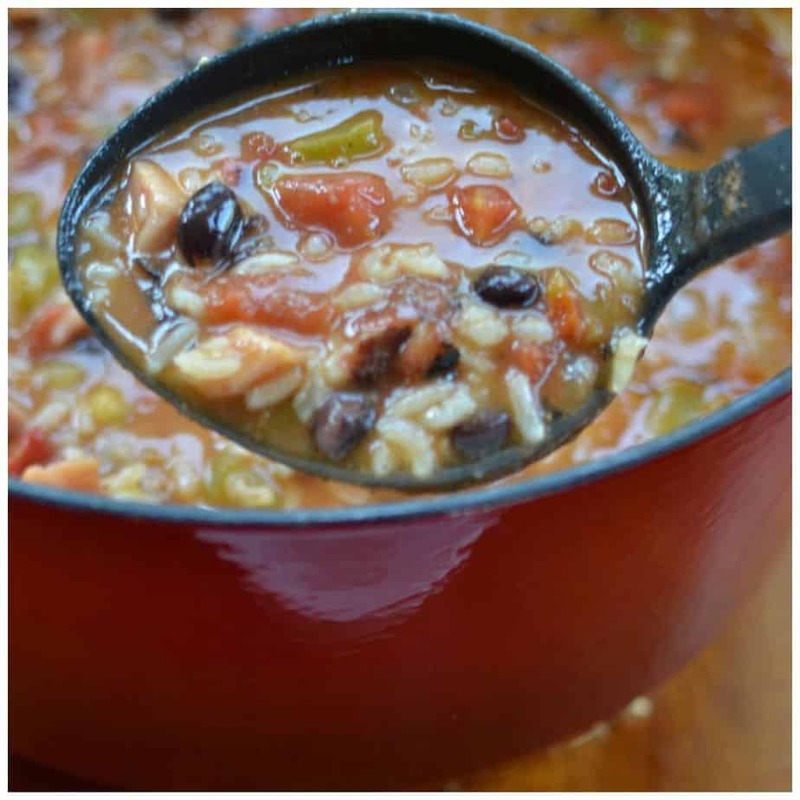 Dust off that heavy stockpot or dutch oven and make this awesome 30 Minute Ham Bean and Rice Soup for your loved ones. They will be singing your accolades. Heat olive oil over medium heat in heavy stock pot or dutch oven. Add onion and green pepper and cook for 2 minutes. Add ham and cook for additional 1-2 minutes. Add garlic and cook for 30 seconds. 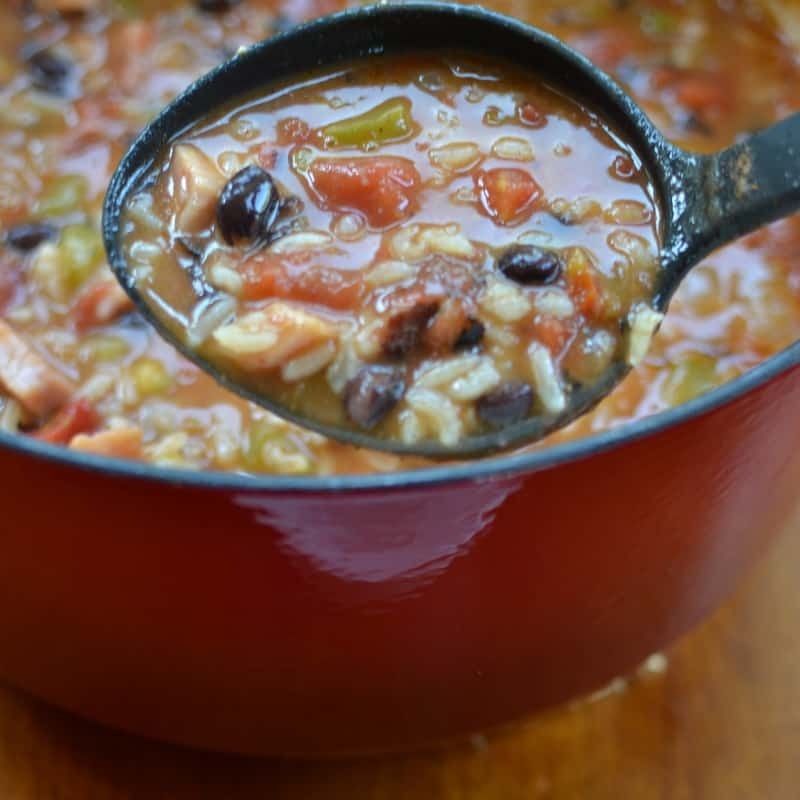 Add chicken broth, black beans, fire roasted tomatoes, Cajun seasoning, onion powder, barbecue sauce and rice. Reduce heat, cover and simmer for 12-15 minutes. (Optional) Whisk melted butter and flour together. Whisk into soup 1 tablespoon at a time and simmer for 2-3 minutes. The last step of making a roux is optional. If you like your soup thicker than you will want to do this step. If you don’t mind it a little thinner skip this step and save the added calories. Other delicious recipes you will love!! 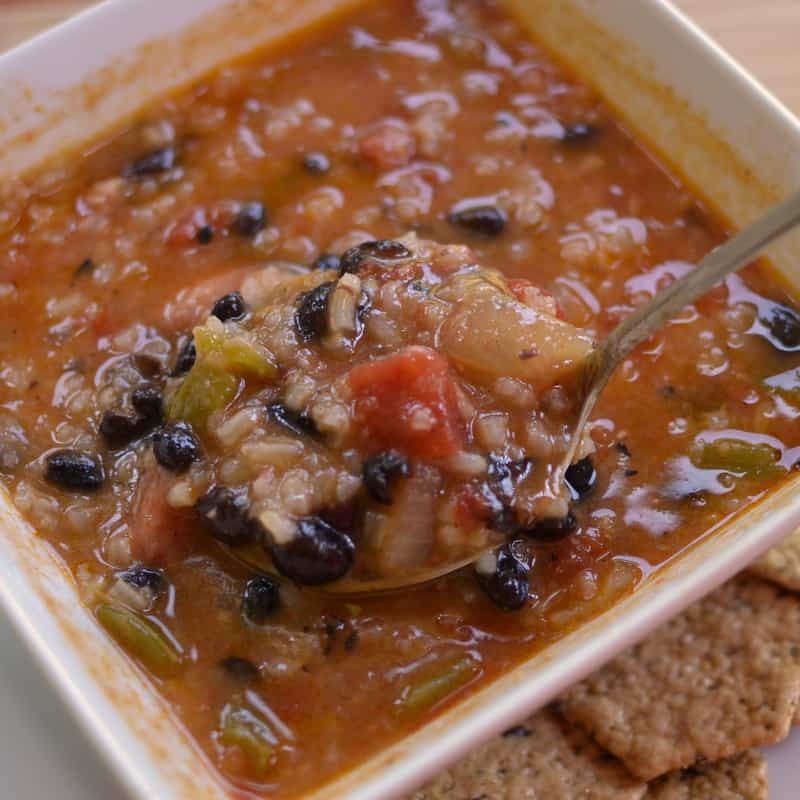 Had the Black bean and ham soup this week. It is really good. I didn’t have the sun roasted tomatoes, so I added chili ready tomatoes, and we really like it. Leftover is just as good. I am already getting your new recipes, and have tried many of them. Awesome! Thanks so much. I love fall cooking. There are so many great recipes and so little time!! 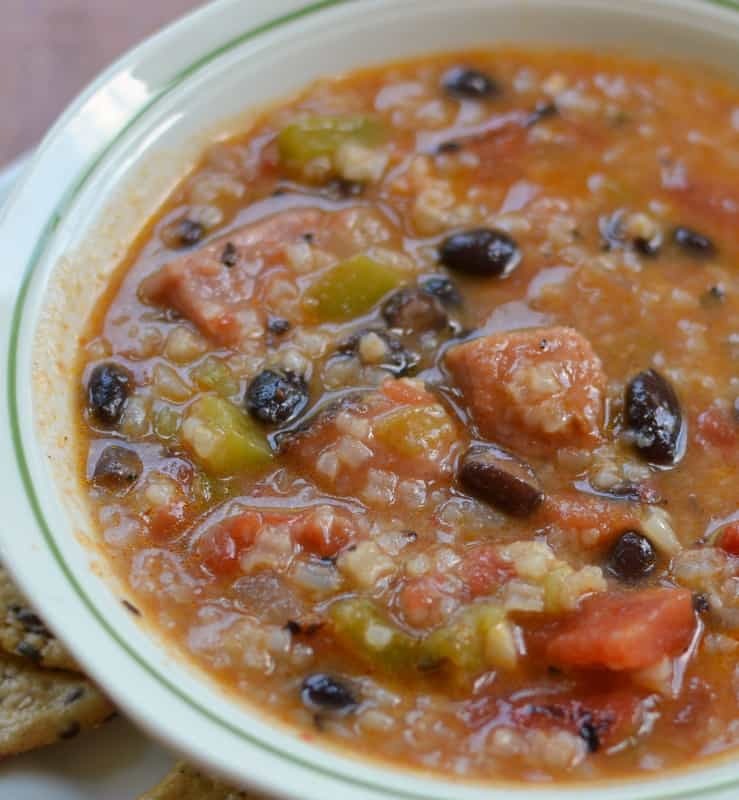 This is a great recipe for a hearty but not heavy soup. I followed the instructions with no substitutes. Great use for leftover ham. Thanks so much Cynthia! I am glad that you enjoyed it! !